Platteville residents say saving the 80-year-old Orpheum Theater turned out to be kind of a hassle. 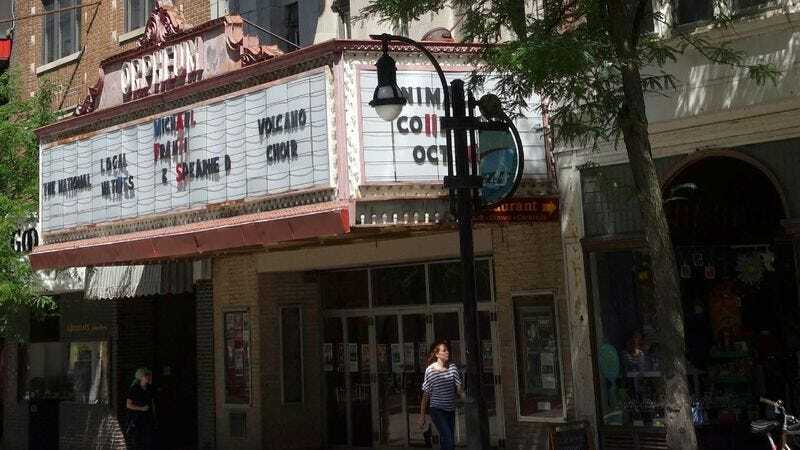 PLATTEVILLE, CT—Just three days after residents gathered in the city’s main square and emphatically vowed to save the historic Orpheum Theater from its scheduled demolition, sources confirmed Friday that the community of Platteville had lost all interest in the cause. Local citizens, who reportedly took to the streets in protest when news broke that the 350-seat community theater would be replaced with a modern two-story shopping center, are said to have, over the subsequent 72 hours, taken stock of the considerable time, energy, and resources that would have to be devoted to preserving the 80-year-old theater, prompting most to quietly discontinue their efforts. While townsfolk confirmed that an ad hoc “Save the Orpheum” committee was promptly formed Tuesday morning following word that the theater was set to be razed, by that afternoon, sources said, such efforts were reportedly already showing signs of faltering, as many citizens’ eagerness began to give way to concerns that they needed to get back to their homes or places of work. In particular, reports indicated that an attempt to have the Orpheum certified as a historical landmark reached a dead end after several volunteer coordinators discovered that securing the legal status required filling out quite a bit of paperwork, which sources said “looked pretty complicated.” Similarly, residents noted that an agreement to begin a mass newspaper letter-writing campaign had only resulted in the drafting of a single letter to the editor, which as of press time had yet to be mailed to the Platteville Herald. According to sources, aside from making vocal statements such as, “This theater is part of our community” and, “It wouldn’t be Platteville without the Orpheum” three days earlier, the vast majority of townspeople had made no effort whatsoever to forestall the iconic building’s demise. “I heard they were talking about getting a Kickstarter going, but I’m not sure what happened with that,” he continued. Less than a half week after the community agreed to “keep the Orpheum standing for another 80 years,” sources reported that each of the major initiatives to accomplish this goal—including a neighborhood-wide rummage sale, a march on the property developer’s headquarters, and an effort to have regular community members star in one last production at the theater to raise money—had yet to progress past even the most preliminary stages, and in most cases had not been elaborated on in any detail at all. Municipal sources confirmed that, with not a single “Our Orpheum” T-shirt manufactured nor a design even settled on, the playhouse’s demolition would likely go through as planned later this month.